Chris Jones' approach to his pinch-hit at-bat that day was a simple one. It was an approach that helped him turn the Reds' one-run deficit to a one-run lead, knocking in two with a triple. "A lot of things were going through my mind when I went up there. Stay back. Be aggressive," Jones told The Associated Press after that June 1991 game. "I told myself, 'Shut up, just hit the ball." Jones made the majors that year for the first time, as a 25 year old. It was also his eighth season as a professional. Jones' went on to have a major league career that spanned nine seasons, part of a professional career that lasted 21. Jones' career began in 1984, taken by the Reds in the third round of the draft, out of Liverpool High School, outside Syracuse, NY. He started at rookie-league Billings, returning there for 1985. He hit AA Vermont in 1987, then first saw AAA Nashville 1989. He then first saw Cincinnati that year in 1991. He got into 52 games for the Reds in that first campaign, hitting .292. Released at the end of the season, Jones started his tour of the National League. He signed with the Astros for 1992, hitting just .190 there in 54 games. 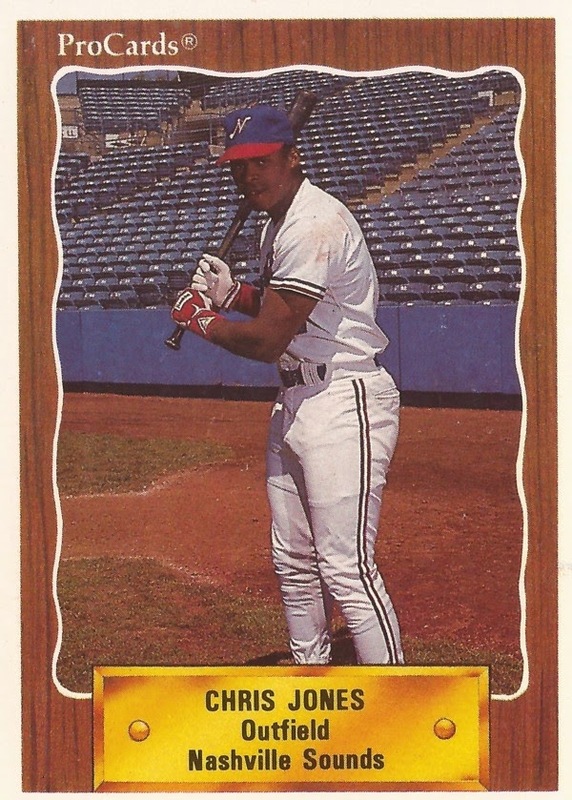 For 1993, Jones signed with the Rockies, playing with them for their first two seasons. For 1995, Jones signed with the Mets. He got into 79 games that year and 89 the next. In late May 1995, Jones, in his role as a pinch-hitter, hit a game-winning home run against the Padres. It was his second pinch-hit home run in four games, The New York Times wrote. "There's some kind of luck on my side," Jones told The Times afterward. "That kind of thing is tough to do. I'm just happy we won the game." In April 1996, Jones hit another game-winner, a two-run shot against his old team, the Reds. Mets manager Dallas Green, though, told The AP he just didn't have a regular spot for Jones, giving time to other players. "Chris Jones is one of my favorite guys, he works very hard to stay ready. I haven't been able to use him as much because of the way I'm trying to experiment with Butch Huskey, but whenever I call on him, he makes a contribution," Green told The AP. "He really hit that one." In late July, Jones did it again, hitting another game-winner in extras, this time against the Pirates. "I don't leave anything on the table," Jones told The AP then. "You're in the majors a short period of time and you have to give 100 percent." Jones finished out his major league career with four more organizations over three seasons. He played with the Padres in 1997, the Giants and Diamondbacks in 1998 and the Brewers in 2000. He continued playing in the minors, though, through 2004. That final season came at independent Newark. He transitioned for 2005 into the Newark manager's office. "I have 21 years of professional baseball knowledge that I am bringing with me to this job," Jones told OurSportsCentral after taking the Newark helm, "and I have tried to learn from everyone I have ever played for, and with." Jones managed at Newark for two seasons, then with the White Sox at single-A Kannapolis in 2007 and 2008.